Sea Breeze… True Blue… White Bliss… Azure and… Thalassa, the euphonic, resonant name Greeks chose some thousands of years ago for their decorously greatest love, the Sea. The mere names of the Myconian Ambassador’s suites speak for the monumental pleasures and experiences awaiting you at this luxury hotel haven. Like a beacon of superb contemporary elegance, it overlooks the lovely bay of Platis Gialos, a precious gem in the diadem of internationally acclaimed adjacent beaches: from cosmopolitan Psarou with its haut monde and superyachts at anchor, to picturesque Agia Anna and Paranga with their authentic little tavernas frequented by the locals. 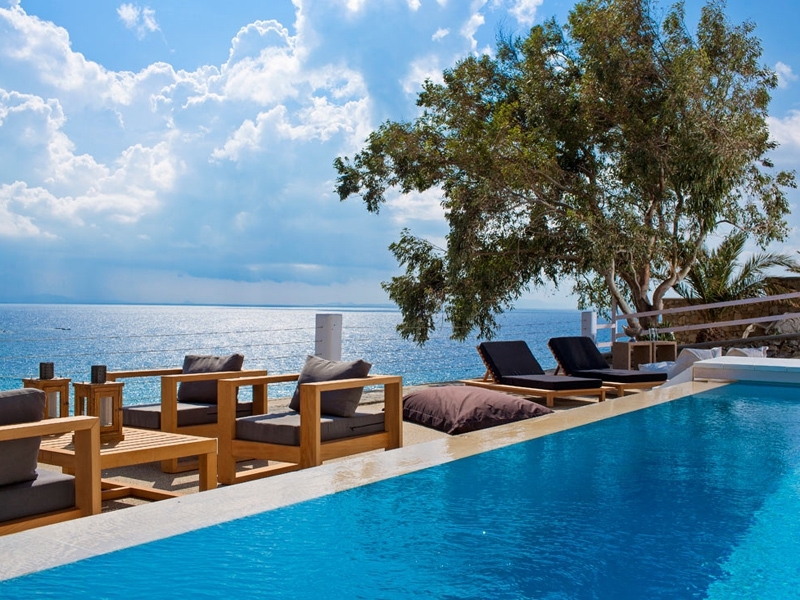 Blending harmoniously with the slope offering magnificent Aegean views and only a few steps from the exquisite sandy beach and crystal clear waters, it amalgamates gracefully the essence of Myconian charm with the celebrated ‘art de vivre’ of Relais & Châteaux. 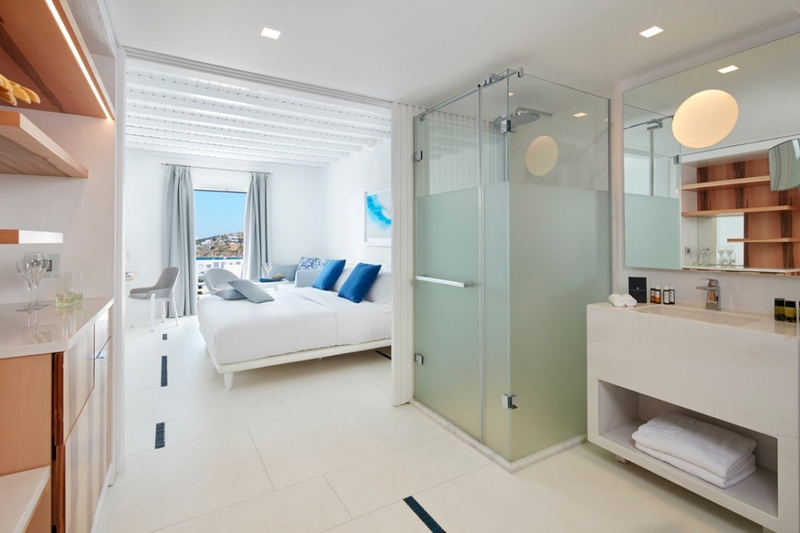 Its architecture merges contemporary chic with tones and textures borrowed from the local vernacular with interiors that embody the clean line and cool sophistication of high design flow into the quiet comfort of deluxe bedrooms. Its spectacular terrace is like a cosmos unto itself, beating to diverse rhythms throughout the day: after a leisurely breakfast at Latitudes, mornings drift enchantingly into perfect poolside afternoons, with light meals and drinks from George’s bar.. And as shadows lean towards evening, when “the unguarded night is seized by memories, red, yellow, purple”, guests return from the beach to mingle over sunset cocktails, before dining in the candle-lit glow of Efisia, one of the island’s top restaurants. The serenity of relaxing away from the island’s party pulse is just as easily given up with a short stroll across to the trendy beaches or a thrilling sail to the mysterious ruins of ancient Delos or Rhenia’s hidden coves on our private launch. Even the vibrant Chora with its whitewashed maze of boutiques and bars is only minutes away by car. From the world class Thalasso Spa, to, to the spectacular pool deck with sweeping views of the Aegean and our courteous staff, the Myconian Ambassador draws on one family’s ancestral ties to the island, and its long-standing legacy of hospitality and personal touch, to bring you a heavenly, unforgettable, authentically Myconian experience. 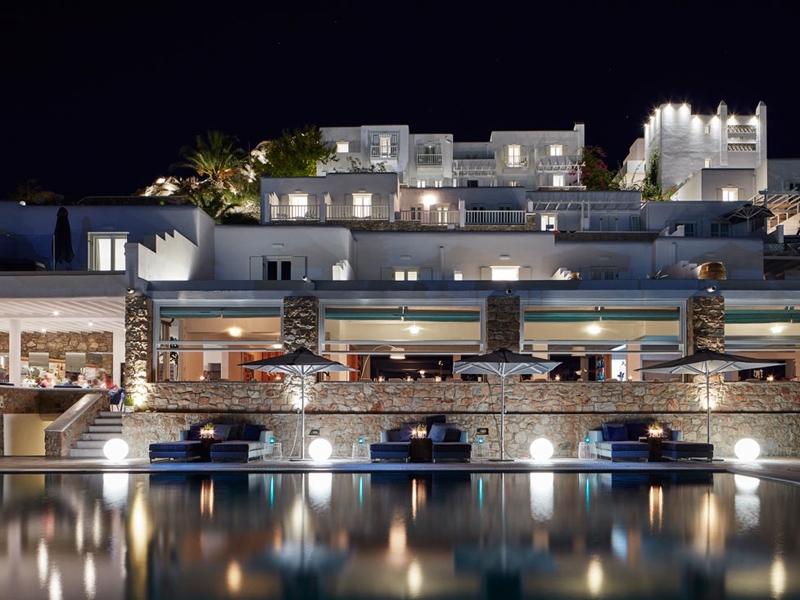 Your cherished senses and soul have truly discovered their ideal Ambassador to this Mykonos Island Paradise. The yoga retreat blends wellbeing with luxury living. 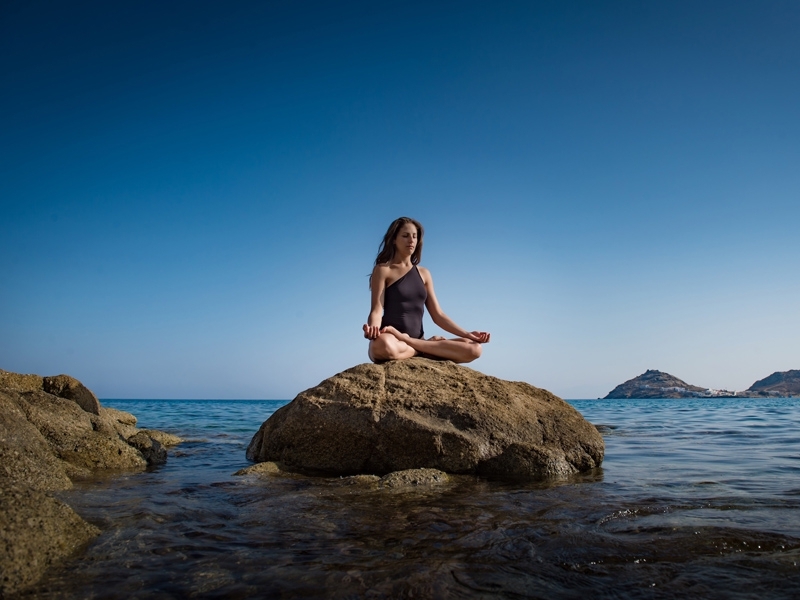 Stay in the 5* Myconian Ambassador Luxury Hotel and enjoy the magic of Myconian hospitality while you recalibrate your body and mind with Think White Yoga & Well-Being! 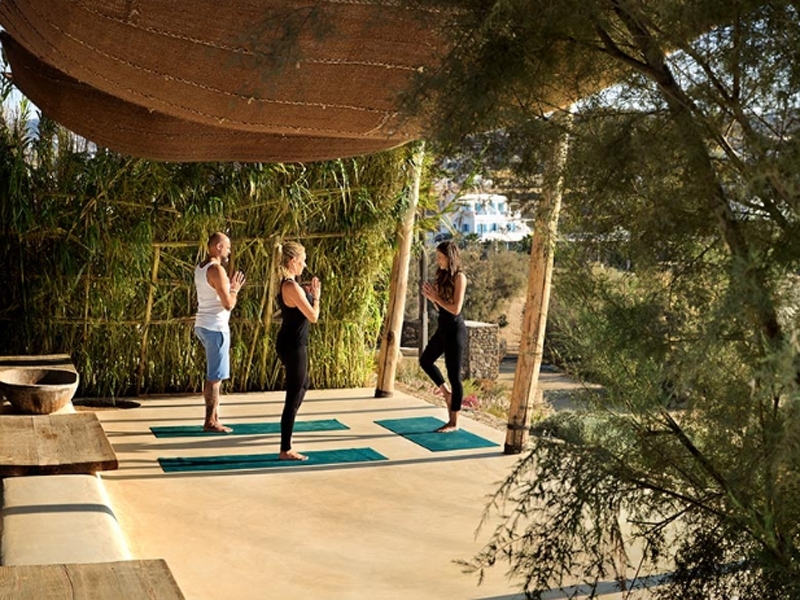 As of 2017 Myconian Ambassador will be hosting dedicated Yoga Retreats with world class teachers at the Ambassador! The restorative power of yoga has the power to place the body and mind in perfect equilibrium! The heidyllic conditions on Mykonos will enhance these benefits! Discover the inimitable Myconian hospitality and enjoy the uniquely elegant luxury of the Ambassador Luxury Hotel. The therapeutic properties of the ionized sea air and saltwater, the relaxing treatments in our unique Thalasso spa, healthy gourmet cuisine made from the freshest local produce by a Michelin-trained chef, and an island with world-class appeal and local charm await you for a holistic makeover!